It's huge, it's slimy, and it's the "single greatest threat to Florida agriculture." Meet the giant African Land Snail. 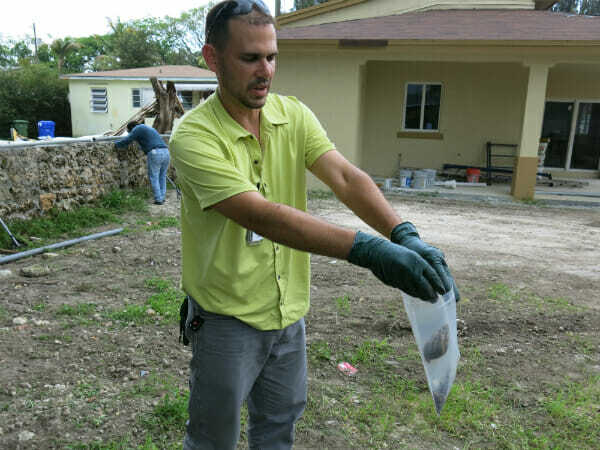 Omar Garcia is a Community Liaison Officer with the Florida Department of Agriculture, a laid-back Miami native who gives pest lessons to grade-school kids. 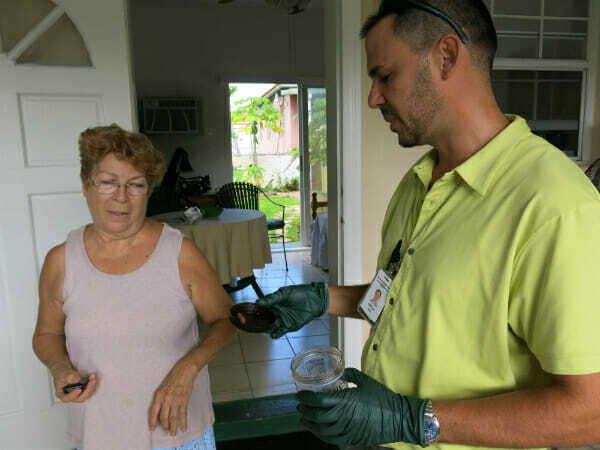 But don’t let his easy manner fool you – Garcia is a trained killer, one of Miami’s 50 full-time employees devoted to wiping out the giant African Land Snail. His days alternate between outreach and extermination. On a recent, chokingly humid Miami morning, Garcia is doing a bit of both. He’s out in the field, answering one of the 10 daily calls to Florida’s snail hotline – 888-397-1517. That number gets a lot of play: it’s on billboards, radio jingles, TV commercials, even a horror-styled movie trailer that’s shown in Miami theaters. It is a huge PR campaign, all for one little snail. Well, not so little. African Land Snails grow up to eight inches, with pointy shells that can blow out a car tire. It’s just as creepy as you would imagine; even scarier is the damage this snail can wreak. Mark Fagan, Public Information Officer for the Florida Department of Agriculture, says they are havoc unleashed, a voracious mollusk with a) no natural predators, b) an undiscriminating appetite for over 500 plant species, and c) the ability to lay thousands of eggs each year. “It is the single greatest threat to Florida agriculture,” Fagan says. Today’s first snail call is an older woman in a drab stucco house. She comes to the door in pajamas, a mewling kitten clutched to her chest. After a little back-and-forth in Spanish, the woman presents Garcia with a small food jar – she gamely captured a snail herself. It’s a little guy, about an inch long, with muddy markings and a spiral shell. Is this the mighty threat that’s causing all the commotion? Actually, no. The well-meaning citizen has found a Rosy Wolf snail, similar in appearance but without the devastating appetites of an African Land Snail. This spring, a Rosy Wolf snail was misidentified in Houston, rippling panic throughout Texas. Misidentification happens all the time, especially here in Miami. Considering the massive reach of the state’s anti-snail campaign, people are calling first, asking questions later. This very morning, Garcia and his amused colleagues have been texting each other photos from a recent house call. A confused man had called the hotline – he’d found a foot-long blue crab. After Garcia confirms the woman hasn’t found an African Land Snail, she asks him to inspect her garden just in case. It’s unlikely he’ll find anything, as her home is many blocks from the nearest confirmed sighting. Still, Garcia says you can’t be too safe. They may move at a snail’s pace, but humans help them travel. 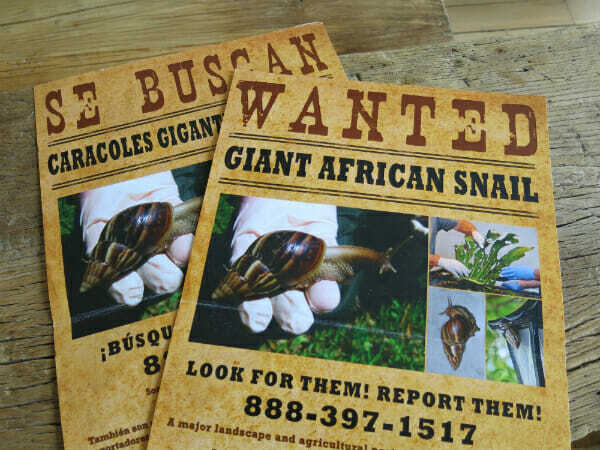 In 2010, over a year before Florida started its eradication program, a man named Charles Stewart was found with a crate of African Land Snails in his suburban Miami house. He is a leader in the African religion Ifa Orisha, and was feeding snail mucus to his followers as part of a healing ritual (bad idea: several people became violently ill). Fagan claims Miami’s first African Land Snail sighting predates Stewart, but he doesn’t spend much time speculating about it. “They’re here now, and that’s all that matters,” he says. In another residential neighborhood, Garcia catches up with a small team of snail hunters at work. While an older Cuban man watches from his stoop, several workers comb his yard with rakes, while others pick through the grass wearing rubber gloves. One woman in a surgical mask spreads fistfuls of molluscicide. Teams like this have collected (read: killed) a staggering 121,000 African Land Snails since the eradication program started in September 2011. They painstakingly search every suspicious property, bagging live snails and sending them to the lab for death-by-freezing. Garcia says the problem is so dire that they don’t need a resident’s permission to enter their property. They aren’t interested in playing cowboys, though. “We always, always get permission, even though we don’t have to,” says Garcia. Many of Miami’s snail-ridden neighborhoods are predominantly Spanish-speaking; a roving crew of state employees with rubber gloves and badges could be a bit alarming. Garcia makes sure everyone understands why they are there, and tries to allay any panic. Garcia inspects a misidentified African Land Snail with the woman who found it. For the last two years, the state’s biggest concern has been containment. Within Miami, the snails are a nuisance, eating stucco off houses, ruining gardens and generally weirding people out. 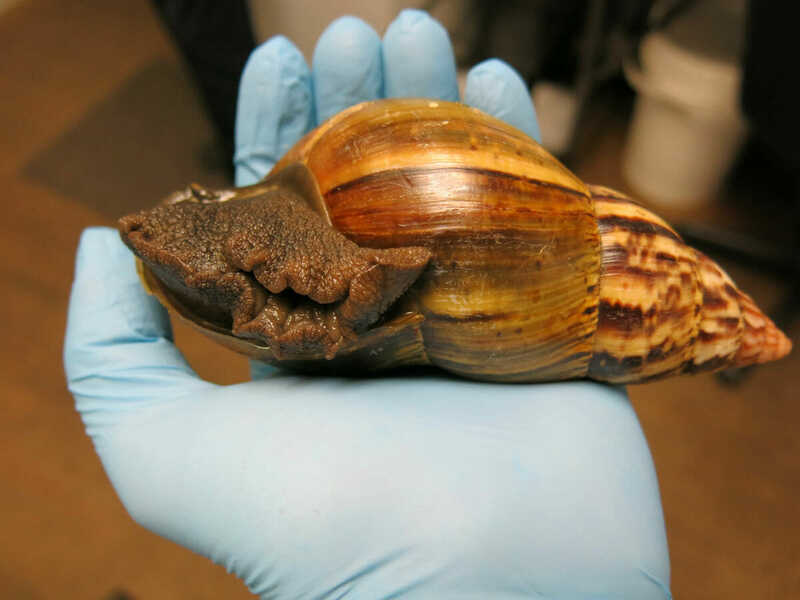 They’re also a mild public health threat – the snails have an appetite for rat feces, and occasionally transmit a nasty disease called rat lungworm. But once you get them into the croplands, there’s no telling how far they could spread, how much damage they could do. Agriculture is Florida’s second biggest revenue source, right behind tourism, generating $133 billion annually. In recent years, the state’s ag economy has taken major hits from stormy weather and the devastating orange disease called citrus greening. Fagan says Florida is not equipped to deal with snails gone wild. He points to countries like Ecuador and Colombia, where African Land Snails have ravaged crops wholesale. There’s a reason the United Nations Food and Agriculture Organization has labeled them one of the world’s most harmful invasive species. Fagan doesn’t like anyone calling it a chemical, preferring the term “organic bait and treatment.” This is mostly semantics. Metaldehyde is certainly a chemical, albeit organic, and the Department of Agriculture will not use it in neighborhoods where residents have chemical sensitivities. Still, metaldehyde is proving very effective in combatting the African Land Snail, with a mortality rate nearing 90%. Every confirmed kill elicits a whoop or a high five.